Teatru Astra proudly announces Giuseppe Verdi’s immortal Nabucco as the highlight of Festival Mediterranea 2014. This production will see Nabucco being staged at the Astra after an absence of twenty years. It was last performed in our theatre in 1994, a production that was a resounding success with both critics and public. Nabucco is a tour-de-force and one of Verdi’s most popular operas and this not least because of the leading role that the choir has in this opera. In fact, the choir in Nabucco is considered one of the main protagonists, alongside that of Nabucco and Abigaille. 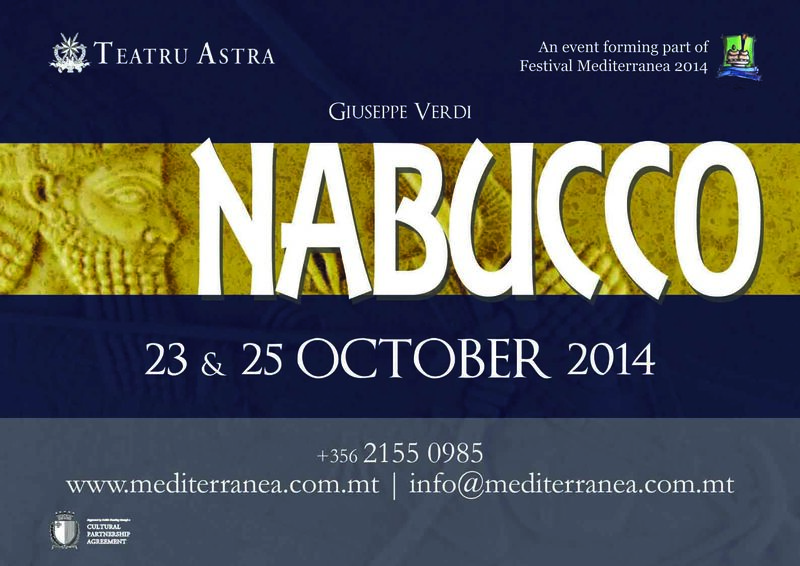 Nabucco will be performed on Thursday 23rd and Saturday 25th October 2014. The Malta Philharmonic Orchestra will be under the direction of Teatru Astra and Mediterranea’s Music and Artistic Director, Prof. Joseph Vella, while the regia will once again be entrusted to Enrico Stinchelli. Teatru Astra has once again managed to engage a star-studded cast for this production.